In February, we hosted our annual Faithful Friends Gathering, a time to thank all of the donors, volunteers, community members, and Recovery Cafe Members who make our work possible. The event was highlighted by a moving talk from Killian, a short story from our Member Mike, and an awards ceremony of a few of the many supporters who made 2016 a great year for Recovery Cafe. Please look below for more info on our honorees and click here to view Killian’s message of hope. 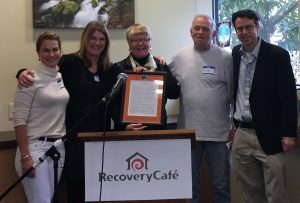 The Medina Foundation received the Executive Director’s Gratitude Award for being an investor and friend of Recovery Cafe’s since our beginning. One of the many wonderful things about the Medina Foundation is they give the best kind of funding. They provide general operating funds which they provide over many years and provide innovative capacity building opportunities. The Medina Foundation truly leads the way in modeling exemplary leadership as a funder in our community. Brooks Running was awarded The Visionary Founder Award. One of the many programs available to Members of the Recovery Café community is the Sole Train Walking and Running Club. Over the years, Brooks has donated hundreds of pairs of new shoes, socks, and sports bras to Recovery Café Members so that they are able to take full advantage of Sole Train. In addition to donating proper footwear to assist our Members in their endeavors to improve their health, Brooks staff has consistently encouraged the message that fitness is possible for all. Brooks staff, including President and CEO Jim Weber, have come to Recovery Café to participate in walks and get to know the Recovery Café community personally. Brooks doesn’t just talk the talk of making the community better, they literally run and walk the walk of making the world a better place. 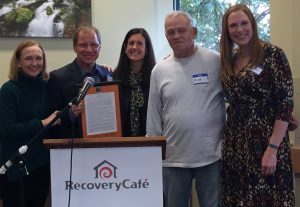 Recovery Cafe volunteer, donor, and teacher Tom Kuebler received the Visionary Founder Award. From almost the very beginning (for more than 11 years) Tom has been a part of our community. 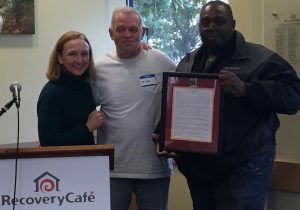 Tom has been a donor, a Bridge Builder for Standing in the Gap, a supporter of various 12-Step meetings at the Café, and he has faithfully served as a teacher in our School for Recovery. His Addiction Recovery class for women and men has been a place of honesty and engaged journey of recovery for the Recovery Café Community. We hope Tom will teach here for at least another decade! 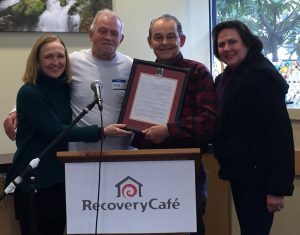 John (pictured far right) was awarded the Contribution of Excellence Award, which is given to a Recovery Cafe Member who has gone above and beyond the call of duty in making Recovery Cafe a warm and welcoming place for all who enter our doors. John has been a Member of Recovery since we moved into our new location in 2010. In the years since, John has gained stable housing and employment, has become a circle facilitator, and leads 12-step meetings. John works closely with our new Members who are just starting their recovery journeys. He has a special appreciation for their experience, having faced many of the same struggles in his own journey. His kindness, welcoming spirit, and commitment to this healing work is an inspiring gift to this transformative community.